Karen Quest has a Fun-Filled Vaudeville-Style Comedy Western Show with Trick Roping, Whip Cracking, Music, Audience Participation and Lots of Cowgirl Shenanigans. Karen has performed All over the United States and Canada, from Singapore to Germany, Charming and Delighting Audiences of All Ages and Sizes with her Special Brand of Western Humor. 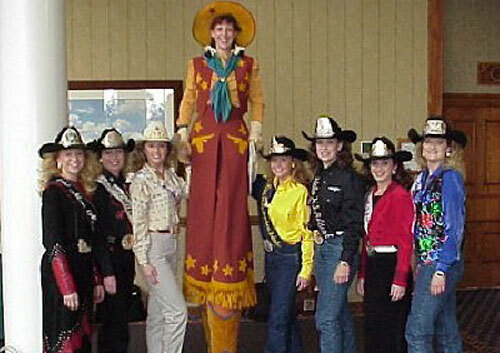 Karen is a veteran of several circuses and variety revues, a graduate and former instructor at the Ringling Bros. Barnum and Bailey Clown College, has garnered the "Whipcracker of the Year","Comedy" and "Most Unusual Trick" awards from the Wild West Arts Club at their annual conventions in Las Vegas. Oh, and an "Attendance" award to boot! In April of 2002, Karen spent two weeks studying with the famous Mexican Charro family, Los Hermanos Escamilla at their home in Juarez, Chihuahua, Mexico. In November through January of 2002-03, she will be making her European debut at a variety theater in Germany. She is featured in the recent book Cowgirl Spirit, by Mimi Kirk. Since she was nine years old, Karen has been carrying around a personalized autographed glossy photograph of Gene Autry and has some cool antique rodeo scarves. Someday she will have her own horse! This entry was posted in Children's Entertainment, Stilt Walkers. Bookmark the permalink.